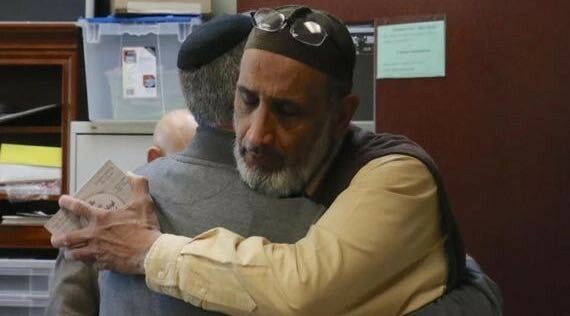 The families of three Muslim college students killed last week in Chapel Hill, North Carolina received more than 3,000 messages and prayers of love and support from people across America. The prayers were collected by Groundswell Movement at Auburn Seminary and delivered to the local mosque in Raleigh, NC by Rabbi Eric Solomon of Beth Meyer Synagogue. Since last week, news of the killings has struck a deep chord in the Muslim American community. Though the shootings may never be formally classified as hate crimes, they take place within a broader climate of hate violence and patterns of injustice experienced through racial profiling, surveillance, detention and deportation targeting Muslims and others similarly stereotyped as foreign and suspect. The shootings in Chapel Hill did not make national news until Muslim Americans and allies took to social media to express grief and proclaim #MuslimLivesMatter, echoing #BlackLivesMatter. Like the shooting of Michael Brown in Ferguson, MI, this most recent tragedy is calling attention to what it is like to be Muslim – or Sikh or Arab – in America today. The 3000 plus prayers represent widespread multifaith support for the Muslim American community in North Carolina and across the country. As the shooting quickly fades from the headlines, this support will become vital as the community pursues justice and healing in the coming weeks and months. As a Sikh American who reported on the 2012 hate-based mass shooting of Sikh Americans in Oak Creek, Wisconsin, I witnessed an unprecedented outpouring of support for the Sikh community even before the crime was formally classified as a hate crime. That immediate support mattered. Long after the media trucks had left, the community relied on strong relationships with new interfaith partners to educate and organize, efforts that continue today. Those who stand with you to mourn, it seems, are the ones who stand with you to organize. Send a prayer or note of support to the Chapel Hill community here.